0,5l Flasche. Braune naturtrübe Fabe mit luftigem Schaum. Starke Gewürzaromen. Zimt, Sternanis, orangenschale und Röstmalz. Geschmack auch sehr Kräuterig und Gewürze die einen langen Abgang haben. Couleur brune trouble, petite mousse blanche. Nez fort epicé, pain d’epice et massepain, un peu sucré. Au gout malheureusement cette bouteille est infectée. Gout très acétique(vinaigre) et mauvais citron. 50 cl botle. Appearance: brown, cloudy, with beige head. Aroma: fruity, spices and cinnamon. Tase: sweet. Palate: smooth, creamy texture. Overall: nice beer. Bottled. Pours a cloudy brown with an orange hue and a medium sized, fluffy, lacing and tan head. Aroma of caramel and spice. Sweet flavor that ends up dry, slightlybitter and bit metallic. Medium bodied, oily text. and average carb, A decent christmas brew but nothing more. Bottle 50cl, a cloudy amber beer with low head. Nose is very spicy on cinnamon, anise and cloves. Aroma is caramel like, malty, sweet spicy notes, too much cloves and cinnamon, not easily drinkable, heavy, body is grainy and spicy, full spicy aftertaste. bottle. Cloudy brownish colour, small and fluffy beige head. Aroma of spices - rather christmasy. 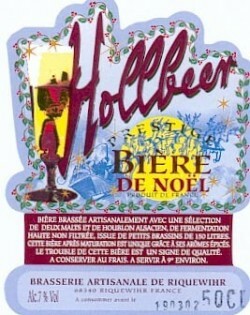 Malty with lots of christmas spices. Unfortunately the beer is quite sour, I’m not sure it is supposed to be so. I appreciate the yeasty and picy christmas character, but I’m not sure about the sourness. It would surely be a great beer, if it was in top condition.